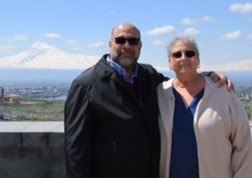 Pam Moroukian asked me to help locate a recipe called “khaveech”. She said it was made with flour, butter and cream, and cooked in a frying pan. It sounded like a type of halvah, with just enough of a description to guide me. While sifting through my Armenian cookbooks, I found a recipe called “khavitz” (similar-sounding to ‘khaveech’) in Sonia Uvezian’s cookbook, “The Cuisine of Armenia”. To my amazement, I found that it used the ingredients Pam mentioned - plus was made in a skillet! I sent it to Pam in the hopes her lost recipe had been found. She believes this could be it, but as of this writing, I haven’t heard if she’s prepared it to know for sure. In the meantime, I received an email from reader, Dorothy Arakelian, who asked me for the khavitz recipe I sent Pam. She wanted to compare it against the one her mother used to make. Dissolve 1 cup sugar in 1 cup heavy cream. Set aside. In a heavy skillet, melt 1/2 cup butter, add 2 cups flour, and cook over a low heat 15 to 20 minutes - until mixture is lightly browned, stirring constantly. Add the cream mixture and continue cooking over very low until thoroughly blended, stirring constantly. Pour into a serving bowl; top with toasted nuts. Here's the difference: Halvah is a very old-world Armenian treat and in those days they did not have cream, heavy or light. And it was not put in a bowl, but, spread and flattened in a flat dish and cut into squares, this was the fudge of that era. I really do not make it too often because in our friends and families we are all always on diets and it is very rich. 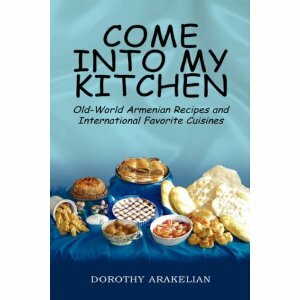 Special Note: Dorothy is the author of "Come Into My Kitchen" (Old-World Armenian Recipes and International Favorite Cuisines). 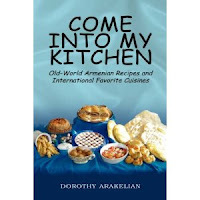 Her book, which was published with the purpose of “passing on old time recipes for future generations to come to keep our Armenian heritage and cuisine alive”, has been available since 2006. 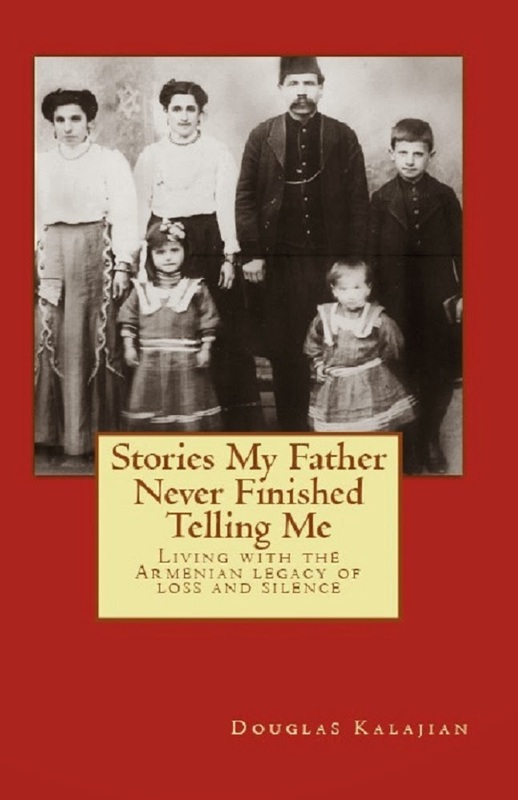 It is available on Amazon.com. To order a copy, just click on our Amazon link at the bottom of this page! Aliur ov Helva or better know as Armenian fudge –Yummy! In a small saucepan heat the water and add the sugar, stirring until sugar is dissolved; remove from heat and set aside. Melt the butter in a large frying pan. Add the flour and cook over very low heat, stirring constantly with a wooden spoon until mixture is slightly tan in color, about 20-25 minutes. Sort of toast the mixture but do not allow to darken. Remove pan from heat and carefully stir in the syrup. Stir the mixture extremely well until thoroughly blended. Continue stirring until mixture is soft, smooth and has a shine. Pour the helva mixture into a large flat plate. Flatten the surface with the back of the spoon and smooth the edges. Using a knife, gently cut diagonal lines criss-cross across the helva to form a diamond shape. Allow to cool and harden before serving. Interesting... "Memoonyeh" (essentially, cream of wheat) is made the same way except you use farina and increase the water. And I swear I saw a similar recipe to the khavitz that used grape molasses instead of sugar (which makes sense, since sugar was probably imported while grape molasses were abundant locally). By the way, I have the feeling Sonia Uvezian sometimes updates the recipes to make them more palatable to the modern cook. I wonder if this is one of those cases. This is how my mom made it in Armenia when i was a kid and that's how i still make it for my kids (not often because it is a heavy dish). cook the flour in the skillet until golden brown ( stirring constantly) then add butter to coat every ounce of the flour (sometimes i use half butter and half vegetable oil to lighten up the dish). Slowly add hot water to the mixture while stirring on the stove. enough water to make the mixture like the consistency of pancake batter. Then add sugar to taste and a pinch of salt. Enjoy while its hot. We make halva the same exact way except we dont put any water and salt. pour the flour mixture with the sugar in a flat plate and put in a the freezer for an hour and enjoy like hard brownie. Interesting, thanks! The ingredient amounts seem quite small; how much does this recipe make? Makes enough to fill a salad/dessert plate for the halva. it is suppose to be flattened on the plate. Because the dish is heavy you cant really eat a lot of it. You can make as much as you want, however. For the khavits it will be plenty to feed 2 people because when you add water the content becomes a lot. BTW: like usual Armenian measurements, my measurements as well are approximate. Thanks for your explanation, I understand 'achki chop' completely! Here is a wonderful step by step instructions of how to make halva. The measurements are precise. And I am afraid you were right my measurements were too little. I just wrote the ingredients without really measuring. But for someone who is making Halva the fist time this is a great site and recipe to follow. Actually, my favorite was grandma's imrig helva, which is made w/ cream of wheat, instead of flour, a bit of cinnamon or cardamom, and sometimes with pine nuts added. We always had it with a light sprinkle of rose water to make it special. Quite tasty! This recipe is very similar to how my grandma used to make it :) Just enough for one plate.